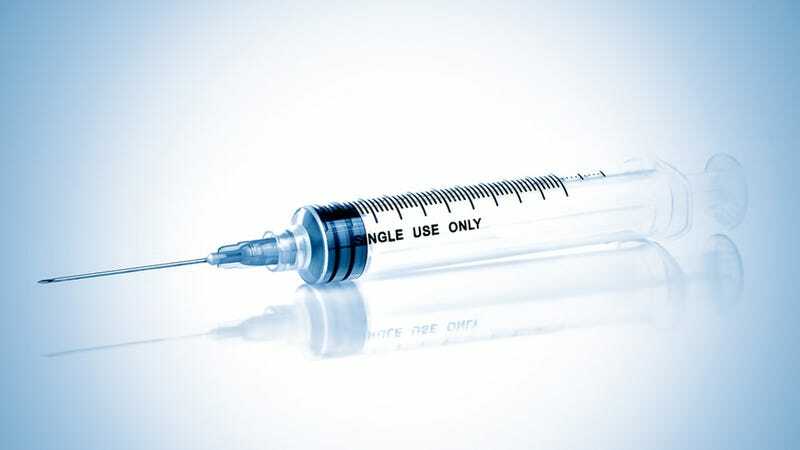 Depo-Provera, the injectable contraceptive that's used by roughly 1.2 million women in the U.S., is incredibly convenient, effective, and relatively affordable. But according to a new study, it has a very scary side effect: doubling your risk of breast cancer. But before you freak out because it's coursing (or has ever coursed) through your veins, it might not be as bad as it sounds. The study, led by Dr. Christopher Li, who is a breast cancer epidemiologist at the Fred Hutchinson Cancer Research Center, found that, when compared to women who'd never had Depo-Provera shots, women who had used it within the past five years were 2.2. times more likely to have been given a breast cancer diagnosis. They also found that factors like family history, obesity, and age didn't make any difference in their risk being affected. The increased risk is most likely due to the fact the Depo-Provera contains progestin. It's a synthetic hormone which is also used in Prempro, a hormone pill used to treat postmenopausal women. A previous study found that taking Prempro (which also contains estrogen) increased the risk of breast cancer by a whopping 24 percent. Another hormone therapy pill called Premarin, which has only estrogen and no progestin didn't increase the risk of cancer in any significant way. So, because Depo-Provera has this scary-sounding progestin, researchers were not entirely surprised to see a spike in cancer risk. However, similar studies in other countries yielded mixed results, so there's more research to do. But the most important thing to remember, according to Li, is that even though a doubling of risk sounds significant, the main risk factor for breast cancer is age, and so the overall risk for women in their 20s and 30s is still very low. In other words, if your risk is already very low, you can double it, and it's still low.